Written by Jasmin Cantzler for The Climate Analytics Blog. Jasmin is a fellow Hertie graduate. Today the presidents of the world’s two biggest greenhouse gas polluters, China and the US, ratified the Paris Agreement. Xi Jinping and Barack Obama’s ratification, ahead of the G20 meeting in China, shows that the momentum to address climate change is strong as ever, making the possibility of the Paris Agreement’s entry into force by the end of this year or early next ever more likely. On the 12th of December 2015, the plenary halls at Le Bourget on the outskirts of Paris erupted in standing ovations, tears and cheers – a turmoil of emotions of relief and euphoria. The Paris Agreement, adopted by 195 governments after a two-week negotiation marathon, was a remarkable achievement and a landmark in the global fight against climate change, rattling off the shock and lethargy following the failure of Copenhagen. But since the wave of euphoria, detractors set in, with many assuming the Agreement would not be operational until 2020. Luckily, the world seems determined to prove them otherwise. To recap the rulebook: The Paris Agreement will automatically enter into force 30 days after it has been ratified by at least 55 countries, and by countries representing at least 55% of global greenhouse gas emissions. Both conditions have to be met before the agreement is legally binding. In April this year, the Paris Agreement opened for signature and ratification. Since then, our ratification tracker followed not just the actual ratification but also the statements made by government officials about their intention to ratify – and when. With China and the US (together accounting for 37.98% of global emissions) keeping their promises made during the signing ceremony in April to ratify the Paris Agreement by the end of the year, the spirit of Paris proves to be alive and kicking. Including the US and China, 26 parties have ratified the Agreement as of 3 September 2016. Another 32 countries have signalled their intent to do so by the end of 2016, bringing the possibility of an early entry into force within reach by meeting both conditions (number of countries and share of global emissions). With two of the world’s top emitters showing their determination to combat climate change, the momentum is likely to continue and boost participation by other governments. Investors managing over USD 13 trillion in assets also urged G20 leaders to swiftly ratify the agreement, reminding them of their “responsibility to work with the private sector”, stating that the “Paris Agreement on climate change provides a clear signal to investors that the transition to the low-carbon, clean energy economy is inevitable and already underway”. Governments have shown in Paris that they are ready to “converge onto a common path, onto a common direction of travel”towards a low-carbon economy. As our work with the Climate Action Tracker has shown, the current climate pledges by governments are certainly not yet sufficient to take us anywhere near the agreed long-term temperature goal of 1.5°C, instead we projected they would keep warming to 2.7˚C, but this ratification is the first step. Paris achieved a common direction for all to pursue “efforts to limit the temperature increase to 1.5°C above pre-industrial levels” and “aim to reach global peaking of greenhouse gas emissions as soon as possible”. The latter means zero global greenhouse-gas emissions by mid-century to be consistent with the 1.5°C efforts. We look to Governments to accelerate climate action and get us on a path to that Paris Agreement temperature goal. Their first step must be to ratify it. I have spent the last couple of weeks in Colombia. I went there partly to celebrate graduating, partly to visit a friend and partly just to go somewhere new. Side note: Colombia is great! Go visit. One of the reasons I became interested in international development (of which there are many) was my desire to go overseas and to see new things. It’s a selfish reason. I know that there are a bunch of problems with volunteering or working overseas. The majority of development work should be carried out by people from the place being ‘developed’ – that just makes sense. But when you’re laying out your career aspirations, it’s useful to be honest. I would like a career that takes me to new places and challenges my worldview, I want to go see the world. I dread the idea of finding myself living where I grew up. (I also want to be able to do creative work, to contribute to something meaningful and to be able to live comfortably while doing it. I’ll probably have to choose between these, but that’s a task for another day). And so, these factors all considered, international development seems like a good fit – it’s got ‘international’ right there in the name! Now, some people might argue that I could discover new places just by visiting them. I could go on package tours or plan long backpacking trips. I have always heard this referred to as “going travelling”. And, I’ll be honest, the thought of it brings me out in a rash. When I lived and worked in Kampala my friends and I would see backpackers in a bar and groan. They were always dressed like they were about to hike over a mountain when they were, in fact, simply having a few beers in a nice bar in a large, cosmopolitan city. Leave your safari boots at the hostel. And then they’d be overenthusiastic about every ‘authentic’ detail – whoa, man, is that a genuine calabash? – while simultaneously only hanging out with other backpackers. Not every experience is life-changing. Having a couple of drinks in a bar is pretty similar no matter where you are. Try talking to some of the ‘authentic’ Ugandans all around you. This phenomenon was such a recurring one that we joked about starting lookatthisfuckingbackpacker.tumblr.com*. Santa Marta is both a tourist destination and a working port, with all the grit that comes with that. In Santa Marta the other week I overheard a group of white people discussing which yoga retreat/hiking weekend was going to be the most rewarding, “spiritually speaking”. They were the only other white people in the restaurant. You’re making us all look bad! Yes, of course arepas are gluten free! Stop asking! Irritating hipster parallels aside, backpacker culture can (inadvertently) stir up nastier waters. In Kampala, I always knew that I could turn up to a film premiere, fancy part or fashion event looking pretty much however I wanted. I could have been out partying for several days, dressed in a raggedy t-shirt, jeans and dirty flip flops and still get let into the VIP section. If my Ugandan friend came looking like that it’s likely that they would get barred at the door. Mzungu privilege. It’s an easy trap to fall into. As foreigners, we should be making the extra effort not to behave like we’re trekking into the wilderness to experience the exotic delights of the new world. We’re in someone else’s city, their home. Dress and act appropriately. Of course, expat development workers are guilty of disregarding this advice too but, in my experience, they’re less likely to than backpackers. Why? Maybe because they work with and know people from the country they’re visiting. Maybe because they are hanging around long enough to notice people reacting negatively to their behaviour. In the wake of the recent Brexit vote and the rise of xenophobia all over the Western world I actually think more people should spend extended periods of their lives living overseas. But living and travelling are hugely different. I propose the three month rule: three months in one place is enough time to get to grips with it. You’ll know your way around, you’ll have figured out where some of the better bars/restaurants/clubs are and, most importantly, you can actually form friendships that will distort your Facebook bubble and open your world up a little more. After (at the very least) three months, you’ll have a genuine glimpse of how life somewhere else looks, really looks. Working overseas is a great way of doing that. If I learnt anything from Colombia it’s that while I genuinely do love travelling oversea, I greatly prefer living there. Now to get back to reality and start churning out job applications. *Still very happy to get this going if anyone is interested. On July 13 of the current year, Addis Ababa, Ethiopia saw the inauguration of the Third International Conference on Financing for Development. The conference came in preparation for the newly agreed upon Sustainable Development Goals1, which are to set the structure in which international actors will work to achieve global development. Organisations, institutions and countries all pledged to fund efforts to end poverty and achieve sustainable development2. The UN, World Bank and their partners made available USD$12 billion through a Global Financing Facility, to improve maternal health and reduce child mortality; similarly, the Bill & Melinda Gates Foundation alongside Canada, Japan and the United States, committed to a total of USD$214 million for development endeavours; other country groups and organisations followed suit. More interestingly, the OECD and UNDP, under the same framework, announced the launching of the programme Tax Inspectors Without Borders. As opposed to pledging money, the programme is designed to help developing countries increase domestic revenues by strengthening their tax audit capacities3. Why the OECD and UNDP’s commitment in Addis Ababa matters for Latin America is a loaded question. Financing development is not only a matter of international aid and donations, but of a country’s own ability to fund, in a sustained manner, their own development projects. In this vein, the TIWB programme will assist Latin America with targeted tax audit strategies and with matters of international taxation. The latter being a particularly interesting characteristic of the plan as the continent’s economic growth is increasingly threatened by the scale of illicit financial (out)flows – at around 3% of GDP5 – from tax evaders and criminals. Improving tax-auditing capacities is an important tool to tackle tax evasion and thus increase a country’s revenues. In the early 2000’s, Chile was experiencing high Value Added Tax (VAT) evasion, with taxpayers blatantly avoiding payment by faking invoices. The country set on a reform venture of their auditing system: they increased the number of auditors and gave them specialized training, simplified the registration process and introduced electronic invoicing to their system. The non-compliance rate fell from 20% to 15% in the course of 5 years6. Recently, with one of the pilot projects of the TIWB programme in Colombia, positive results were evidenced when, after a series of tax audit advice and guidance were set in motion, tax revenue increased in the country USD$36.6 billion in 2011 to USD$47.7 billion in 20147. A sound tax system that can efficiently mobilise national resources is essential for Latin America’s fight against poverty and subsequent development. With 13.3% of the continent’s people living in poverty8 (around 80 million people), national programmes that target the poor, such as conditional cash transfers (CCTs), need a stable flow of income. CCTs in Latin America are financed by national governments, and have proven to have inequality-reducing effects in Chile, Mexico, and Brazil9. In the latter countries, their CCT programmes achieved to reduce overall inequality by 5%10. Indeed, most of the world’s programmes targeted at the poor are actually funded by national governments11. This makes stable and sufficient tax revenues a moral imperative. Increased revenues are not only beneficial for targeted programmes, they also augment the ability of governments’ to invest in the provision of public goods, such as infrastructure, education, health. The volatility inherent to Latin American countries’ tax systems12 due to high levels of tax evasion and implementation problems is therefore detrimental not only for the poor, but for society as a whole. Tax Inspectors Without Borders is essentially tackling under-financing from the roots. It is offering Latin America and other developing regions the opportunity to strengthen one of its core institutions; successful pilot programs, such as the Colombian case cited above, certainly lift hope of the benefits that may arise for our continent once the programme is properly in place and full-fledged. 6 Russell, Barrie (2010). Revenue Administration: Developing a Taxpayer Compliance Program. INTERNATIONAL MONETARY FUND: Fiscal Affairs Department. Pp.13. 11 Banerjee, Abhijit and Duflo, Esther (2012). Poor Economics. Penguin Books. Pp. 5. Sleeping Rough in Geneva: What is behind Unpaid Internships at the UN? The international press have been quick to jump on the story of David Hyde — the 22 year old New Zealand intern found squatting in a tent on the shores of Lake Geneva due the impossibility of meeting the city’s exorbitant rents on a UN salary of zero Swiss Francs (CHF). As a law graduate with recent Master in Public Policy eager to start out on a career in international affairs, David’s struggle to afford the strangling prices of a city consistently ranked among the world’s top 10 most expensive is one to which I can closely relate. Fortunately – for me at least – I am able to call a small apartment home and so far have not had to resort to a tent. Nonetheless, many a time I have found myself munching on nothing more than plain baguette after weighing up the horrendous prices of a more traditional bakery lunch – a humble ham sandwich (forget about the cheese!) will set you back nearly 10 CHF in many places. Of course it is not fair to him but, in some respects, David has had it easy. At just 22 with only four years of study – and presumably four years of cumulative student debt – under his belt, David’s finances are potentially a lot healthier than those of many graduate job seekers today. Many of the UN’s other unpaid interns have spent five, six, seven or more years scratching out master’s degrees and doctorates at the world’s best (and most expensive) universities, only to find themselves working for free. I have known qualified medical doctors with public health master’s degrees to be on the World Health Organization’s books as unpaid interns. Sadly, such stories of over-qualification and under-valuation are more common than they are unique. The point I am making here is that the discourse on David Hyde’s dilemma, whether justifying or scandalising unpaid internships looks only at snapshot in time and fails to grapple with the further issue that ambitious and talented young people often undergo years of financial sacrifice just to be eligible for a coveted internship at their dream institution. Of course, students will always be poor. That is a truism that one cannot challenge. Being a student is as much about learning about life outside the classroom as it is about books and grades. There is nothing like a couple of weeks of a lavish indulgence followed by a couple of weeks of acute poverty to teach us the finer points of monthly budgeting and personal finance. But whereas obtaining a good bachelor’s degree peppered with a bit of work experience over the summer breaks used to be a pretty fail-safe launching point to a junior position, the hard truth is that today over 5 years of study, a master’s degree or two, and a host of paid or unpaid internships is no ticket to employment. At the UN, for example, entry-level professional positions – “P1” – simply do not exist. You’ll need to miraculously summon two years work experience from the day of your graduation just to qualify for a P2 position. Ultimately, the problem here is not that the UN requires highly trained and experienced entry-level candidates – after all, this is a highly sought after employer operating in a competitive, global market. Rather, the problem is that such reasoning ignores the fact that just getting to graduation day costs vast quantities of students’, parents’, or even the government’s precious savings, leaving highly qualified graduates in a precarious position. Although US tuition fees are at the high extreme of the global spectrum, the fact that average graduate loan debt in the US hit $35,000 in 2015 is indicative of the predicament young job seekers face around the world. Investing three, six or even 24 months of your time to make contacts, demonstrate your skills and learn the ropes is not simply a matter of roughing it for a few nights, akin to pitching a tent on your new plot of land before you are able to afford the bricks and mortar. Instead, it is more like sleeping rough deep in an excavated building site. Sure, you might have some pretty solid foundations lying around that in theory could support a skyscraper. But without the money to buy construction materials, you’re not going to be able to build the home you dreamed of. What is worse, with just a bit of rain, you will soon be up to your neck in mud. 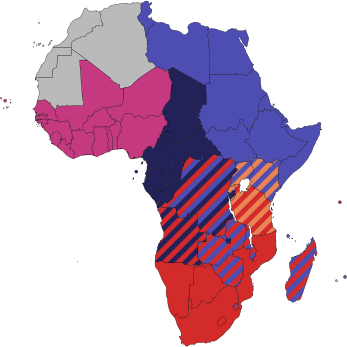 On June 10th three African Regional Economic Communities (RECs) have finally achieved what Cecil Rhodes never did by truly connecting Cape to Cairo. Rather than by railway lines and exploitation they have done this by forming the Tripartite Free Trade Area (TFTA). The Southern African Development Community (SADC), the East African Community (EAC) and the Common Market for Eastern and Southern Africa (COMESA) represent 26 countries with 625 million people and more than 50% of the continent’s GDP. It’s a remarkable step towards the Pan-African dreams of the founding figures of modern African states even though ratification and implementation will probably take years. However, the global media’s commentary on this development has been pretty critical. Hilary Matfess writes on Quartz Africa that the TFTA is “bound to disappoint” like the other RECs have in the past. The BBC’s Lerato Mbele is a bit more optimistic, but points out that “despite so many regional bodies, trade has not benefitted”. Admittedly, intra-continental trade has been quite stable at around 12% of total trade compared to Europe or Asia where it reaches up to 60%. Yet the pessimists are making two age-old mistakes in reporting on African economic development: they don’t contextualize and they are not specific enough. The context of Africa’s under-performance in intra-regional trade is still deeply connected to colonial pasts and the dominance of neoliberal development economics. Transport is a major hurdle to trade on the continent as the existing infrastructure has been designed by colonialists and western development consultants after independence to bring raw materials to the coast and ship them to Europe. For example, nobody ever built a decent road link between the two major coastal cities of the East African Community, Dar es Salaam and Mombasa. The five EAC countries estimate that they will need between USD 68 and USD 100 billion to reach their infrastructure development goals for 2025. Furthermore, Matfess sees a problem in a missing comparative advantage between commodity-dominated economies. This economic structure is a legacy from colonial times and international trade regimes. Exports of raw goods met much lower duties in the rest of the world than manufactured products. Value-addition was punished. Luckily, this structure is changing. In the EAC services make up already 41% of total exports and the trend is pointing upward across most of the continent (see WTO Database). Have a look at the numbers for the TFTA members: The share of intra-regional exports in SADC increased from the famous 12% in 2000 to 17% in 2013. COMESA was at a much worse 4.8% in 2000, which is not surprising when you see that membership stretches from Libya to Swaziland. Yet, COMESA’s intra-exports eightfolded in total numbers and climbed to 9.4% of total exports in 2013. The EAC was the most successful rising from 17.5% to 19.5% over the same period. (All numbers from UNCTAD). The latter in particular should be applauded – this progress has come since the EAC’s relatively recent creation in 1999. Burundi, Kenya, Rwanda, Tanzania and Uganda have managed to not only establish a Customs Union and a Common Market, but they have also ratified a Monetary Union Protocol, improved movement of workers and are working closely together in political affairs in general. Of course regional integration in Africa has its troubles and I have written about it myself. Similarly, the TFTA roll-out will not go smoothly and should not be seen as the panacea for intra-African trade. You can certainly be critical of the RECs and their performance so far, but do it in a precise and contextualized manner. For a more nuanced analysis of the TFTA, check out this interview with Razia Khan, head of Africa economic research at Standard Chartered. If the economic argument for protectionism does not make sense, it seems like Tanzania’s latest anti-regional decisions are based on nothing more but good old nationalism. Tanzania has a long (positive) history with nationalism since its first legendary president Julius Nyerere put a lot of effort in uniting the nation after independence: by pushing for Kiswahili as a uniting language for all tribes (there are more than 120 languages spoken in Tanzania), but also by pursuing a relatively closed socialist economic model. An initial attempt to create a united East Africa failed in 1977 also because Tanzania felt it was not getting the best deal out of it and nationalist sentiments (in most EAC countries to be fair) destroyed the regional spirit. Whilst nationalism was definitely beneficial and a good idea after decolonization to avoid ethnic tensions that wrecked so many other young African states, it seems to make much less sense nowadays. Yet, it is highly in fashion: besides the anti-EAC decisions Tanzania’s Minister of Finance has announced to plan the next budget without donor money (without mentioning how to close that gap) after partners have withheld funds over a corruption scandal and announced steps to fight against the use of the US Dollar in domestic transactions (without addressing the reasons for the Shilling’s instability). The only one really profiting from this wave of nationalist policies is the ruling CCM party, as elections are coming up in fall and a nationalist platform tends to pay-off at the polls. Here is where the actual problem lies. Tanzanians will vote in favour of anti-Kenyan policies and could not care less about the EAC. There is no party that is actually actively campaigning with a pro-regionalism stance. While the public and private sector are trying to progress integration on the technocratic level and President Kikwete speaks in favor of the EAC at regional gatherings, I doubt that any CCM politician will even mention the Community in a speech in front of the “Wananchi” (the ordinary people) – the EAC is not a vote catcher. Many Tanzanians have never even heard about the EAC, let alone understand what their people actually do besides living in nice houses and driving big cars (a motorbike-taxi driver found it hilarious that I work at the EAC, but am still riding along on his bike). Though, this is understandable. Besides businessmen or people in border areas that might do some trading, the East African Community does not affect their life at all. Their socio-economic situation does not allow trips to neighbouring countries and EAC regulations have not really reached the daily life yet, as they do in the EU. I can only really speak about the situation in Tanzania, but I assume that this issue looks similar in the other four Partner States. You might realize now that I had left out “the people” when I listed all stakeholders in the beginning that are keen on regional integration on the African continent. “AND WHEREAS in 1977 the Treaty for East African Co-operation establishing the East African Community was officially dissolved, the main reasons contributing to the collapse of the East African Community being lack of strong political will, lack of strong participation of the private sector and civil society in the co-operation activities…”, Preamble of the EAC Treaty 1999. Ironically, the EAC sees itself as a “people-centered” union: A term that also we at GIZ gladly put in the reports about our work. Seeing that, we should not be surprised about the nationalist sentiments, but about such misconceptions created by the bubble that we work in. I don’t want to say that our project has not realized this shortcoming. In fact, the opposite is true: One module focuses on improving the communication strategy of the EAC Secretariat and another one works on integrating the civil society in the EAC processes. However, the latest examples support my impression from talking to regular Tanzanians that we are still god-damn far away from making regional integration in Africa a truly people-centered project. While the EAC’s benefits are already indirectly felt by most citizens, the project planning and execution itself is carried and informed almost entirely by elites. If you complain about the EU being detached from the citizens, you’ll feel better after a look at the EAC. In a Community of five democracies in which politicians will try to appeal to voters, it is dangerous if the people are utterly unaware of the possibilities of opening up and uniting on a regional level: The results are noticeable in Tanzanian politics at the moment. I can only hope that governments and development partners step up their efforts on bringing the regional integration project closer to the people and begin to work on creating a deeper East African identity. Looking back at my own case and seeing what has made me the European that I feel I am today, is that I studied abroad. Many have said that after decades of European elitism, finally the first generation is taking over that has adopted a true European identity partly created by the pan-European Erasmus exchange program. Recently, German President Gauck visited Tanzania and gave a speech at the EAC Secretariat. At one point, he spoke about issues of identity and suggested that the EAC should think about introducing their own version of the Erasmus program. I think that is a great idea and maybe in 30 years I will be able to meet Tanzanians who feel as estranged by nationalism as I do now. I like the European Union. I enjoyed studying abroad, I appreciate not having to go to a Forex when I travel from Berlin to Rome, I am able to buy affordable duty-free yummy French Camembert in Germany and I like that I have the opportunity to apply for jobs anywhere around the EU without thinking about permits, visas or the like. Of course, I know that nationalism has seen a revival in Europe. I have watched the news and seen Front National growing strong in France or Islamophobic ‘Patriots’ marching in the streets of Dresden every Monday night. Yet even among those die-hard critics of the EU there is consensus that at least the economic integration process (let’s not include the single currency here) of Europe has been beneficial to all Member States and to the large majority of their citizens (Greeks might disagree). To me this has always been a hard fact and even one that can be generalized to other areas of the world: regional economic integration will pay-off. In fact, it is one of the few projects for economic development in Sub-Saharan Africa on which almost all politicians, donors, businesses, civil society actors of different camps can agree easily. African Regional Economic Communities (RECs) are praised by the African Union for healing the scars of arbitrary colonialist borders, supporting local business development, fostering cultural exchange, supporting intra-African trade and other wonders. The latest African Development Report by the African Development Bank presents the arguments well and gives a solid overview about the status quo. As a convinced European I thought it would be interesting to see how this wonderful idea is put into practice and I managed to get an internship position with the German development cooperation (GIZ) at their support program for the East African Community (EAC) which is based in Arusha, Tanzania. The EAC is commonly described to be the most progressive and ambitious REC on the continent and has reached quite some milestones so far. Its five Partner States Burundi, Kenya, Rwanda, Tanzania and Uganda have rolled out a Customs Union, continuously expand the scope of their own Common Market and have even agreed to enter a Monetary Union with the planned introduction of a common East African Shilling in 2024. Studies tell you that the EAC is a role model for similar organizations. When I attend regional meetings I have the feeling that true progress is being made. Representatives from all partner states work together well and have an East African approach to many issues the region faces. It’s the image I also get in my private life. Recently I went to “Sauti za Buzara” in Zanzibar, the most prominent music festival in East Africa. I saw great acts from Rwanda, Kenya and Tanzania and danced with Ugandans and Burundians alike. Other weekends I take the bus across the border to enjoy big city life in Nairobi or some Kenyan friends come over to pay us a visit. All I want to say is that – to me – East African regionalism is real and both my private as well as my professional life shows me how it can work – It looks like my optimistic expectations have actually been met. Alas, I am living in a bubble and it burst about two weeks ago. It is not the first time I got a reality check since I work at the EAC, but this time it was more brutal than before. Tanzania – our beloved host country – just gave regional integration efforts the bird. Again, it did not come as a total surprise. Tanzania has always been a bit reluctant about opening up towards its East African partners. The so-called “Coalition of the willing” made up of Kenya, Uganda and Rwanda had already realized that and created what we termed in the EU as a “two-speed union”. While the Coalition has arranged for citizens to travel quite freely across these three countries, scrapped work permit fees and made progress on common infrastructure development, Tanzania took things a bit more slowly and only hesitantly implements previous EAC policies. Yet, two weeks ago the Tanzanian government came up with two decisions that were not only not helping to further integration, but actually represented a fundamental step backwards: Firstly, the Civil Aviation Authority ordered the region’s biggest airline, Kenya Airways, to decrease its flights to Tanzania from 42 to 14 per week. Secondly, the Tanzanian parliament voted for a highly restrictive new immigration law that makes it even harder to get a work permit as a foreigner than it is already. The first decision has been taken back for now and the second still needs to be confirmed by President Kikwete, but they both sent a strong signal: integration is definitely not top priority. It is especially frustrating for us at the GIZ because two of our focus areas of cooperation are Trade in Services and Free Movement of Workers. On top of that, Tanzania is the second biggest economy and the largest country in terms of population in the EAC – an actor you want to have fully on board. But why does such a major player dither like that? You might think that it would make economic sense to go for a bit more protectionism. After all there is some inequality between EAC countries and some Tanzanian companies are likely to lose out by having to compete with their more efficient Kenyan neighbors. Moreover, especially Chinese actors here are often criticized for bringing in workers for tasks that many Tanzanians would be able to do and with 65% youth unemployment jobs are very much needed. Yet, on a second look, the economic argument is hardly valid. Overall, Tanzania has grown strongly since economic integration began in 1999: its GDP per capita more than doubled over the years and regional trade has taken a similar route. Looking specifically at the two recent decisions, Tanzania would suffer dearly. The country’s important tourism industry complained strongly to President Kikwete when the ban was announced, as many of their customers are flown in by Kenya Airways and Dar businessmen rely on air transport to the business hub Nairobi. Tanzania’s own national carrier went bankrupt some time ago, local Precision Air does not have sufficient capacity to step in and the budget carrier FastJet is not allowed to operate in Kenya yet (some say that retaliation for this was the reason for the Kenya Airways ban in the first place). Concerning the other bill, Tanzanian businesses rely on bringing in foreign experts to close a great skills gap caused by a broken and underfunded education system. For many technical and higher managerial jobs that the country lacks enough skilled candidates to fill all positions. Simply restricting companies from recruiting outside of the country will not magically create a highly-capable workforce. It seems like there is little ground to draw back from regionalism for economic reasons. Could we be facing the return of the spectre that haunted and finally helped to destroy the last attempt at an East African Community in 1977?